That's some roster if playing "Spot the Muslim Brotherhood Front" is a hobby. Clearly, it's not the professionals' pursuit. On being quizzed by the Daily Caller, for example, cathedral spokesman Craig Stapert had no idea that two of the invited groups were unindicted co-conspirators in the landmark Holy Land Foundation Hamas-financing trial. A kewpie doll to the reader who can pick out the unindicted co-conspirators in the cathedral's guest list (ISNA and CAIR -- right!). A cigar to anyone who knows the name of the man who is both ISNA president and ADAMS executive director (Mohamed Magid). And which group tops the "list of our organizations and the organizations of our friends" in the Muslim Brotherhood document explaining the "Civilization-Jihadist Process" underway in the U.S.? Here's another hint. The U.S. government entered this "Explanatory Memorandum" into evidence during the 2009 Holy Land Foundation trial. It explains that the organization's secret "work in America is a kind of grand jihad in eliminating and destroying Western civilization from within and 'sabotaging' its miserable house by (Westerners') hands and by the hands of believers so that it is eliminated and Allah's religion is made victorious over all other religions." The answer, of course, is ISNA. Speaking of the Muslim Brotherhood, here's a bonus question: Where did the first delegation of Egyptian Muslim Brotherhood to visit the U.S. make a beeline from the airport to visit? The residence of South Africa's Ebrahim Rasool, reports South African news site City Press. Meanwhile, the Episcopal Church blindly, blithely thinks the cathedral's Islamic service "demonstrates an appreciation of one another's prayer tradition." In fact, it is against Islamic law for Muslims to hold Christianity or Judaism in the same regard the Episcopal Church is now showing Islam. Indeed, Islamic law "abrogates" (cancels) Christianity and Judaism as "previously revealed religions (that) were valid in their own eras," but are no longer -- not after the advent of Islam in the 7th century. I am quoting above from "Reliance of the Traveller," the authoritative Sunni law book, which, in explaining the "finality" of Islam (page 846), asserts that it is "unbelief (kufr) to hold that remnant cults now bearing the names of formerly valid religions, such as 'Christianity' or 'Judaism,' are acceptable to Allah" post-Mohammed. ("Unbelief," meanwhile, is an act of Islamic apostasy and punishable by death.) Clearly, no devout Muslim can show "appreciation" for the "prayer tradition" of a "remnant cult." The sharia textbook is definitive about this point, adding: "This is a matter over which there is no disagreement among Islamic scholars." Not surprisingly, then, Ebrahim Rasool's prayer-service statement conveys no interfaith reciprocity. Instead, he presses the need to "embrace our humanity and to embrace faith" -- not "our faiths" (plural). As usual, Islamic "outreach" is a one-way, non-ecumenical street. But how could it be otherwise, according to Islam's own teachings? 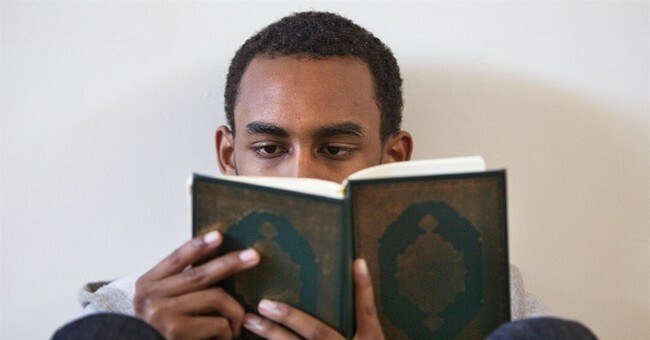 Islamic expert Andrew Bostom notes that the Koranic prayers Muslims recite daily and specifically on Fridays "include, prominently, Koran suras (chapters) 1, 87 and 88." Sura 1, verse 7, he notes, is repeated up to 17 times per day by observant Muslims. It calls on Allah to guide Muslims "to the straight path, to the path of those you have blessed, not those who incurred (Your) wrath, nor of the misguided." The former group ("wrath") is Jewish; the latter ("misguided") is Christian. This is not exactly a "prayer tradition" that encourages the "appreciation" Episcopalians undoutbedly expect. It gets worse – at least for Christians and Jews. Typically, Friday “Jum’ah” prayers, following Mohammed’s own example, include Suras 87 and 88, Bostom explains. These verses are almost palpably acrid with hell-fire and humiliation for Christians and Jews, according to authoritative Koranic commentaries. Most conservatives will look at this cathedral event as a milestone for "Islamism" -- as though Muslim Brotherhood-linked organizations and their activities have little intersection with Islam itself. Does that make sense? Not when the anti-Christianity, anti-Judaism law under consideration here is itself Islamic -- as quintessentially Islamic as the prayers themselves. And not when sharia is the codifed mainstay of Islam.